Wednesday afternoon we had the beginnings of our new second floor. The corner to the right side of the photo will be the master bathroom. The tub will sit under the small high windows. In the middle of the wall will be the kids’ bathroom, and on the far end will be our older son’s room. He’s going to have a great view to the backyard. We’ve opted for fairly large windows on the second floor to provide natural light and solar gain in the winter months. 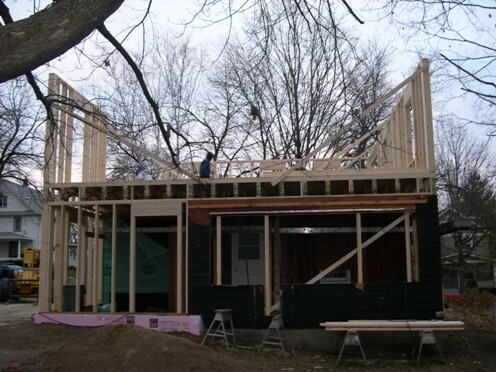 The west end of the house is to be framed next. You can see from previous posts how the house will now be squared off. Putting a second floor over the new mudroom/entry and the existing porch has allowed us to add two more bedrooms. Our family entry will now be on the west side of the house rather than the driveway side. (See the framed doorway about 1/3 of the way from the left.) 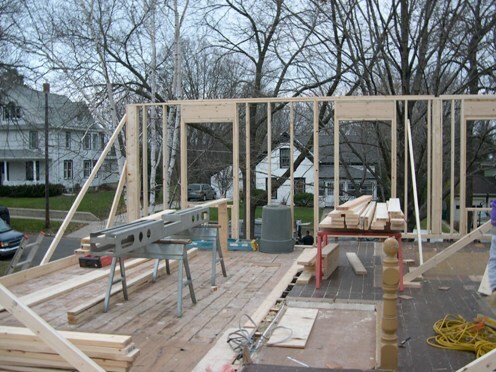 This will allow a sight line all the way through to the front window of the house, which will visually expand the space. 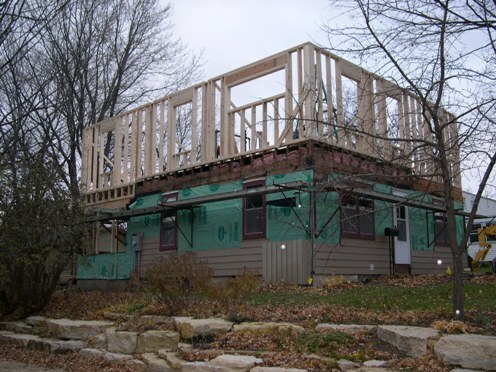 We’ve been asked, “Why cut off the whole second floor?” Well, we made a list of all the things that needed replacing: windows, siding, flooring, bathroom (whole remodel), lighting, roof, insulation and plaster/drywall. The things worth saving were: our newly installed toilet, an antique towel bar, and the newel post. The toilet and towel bar in the garage, and the little newel post has been the “last man standing” all week. That 102-year-old has been standing strong–a testimony to good work and materials of long ago. You can see it in the bottom right hand corner of the photo. One of our unwritten goals (as it is with all of our projects) is to create something that will last the test of time and be worth remodeling 102 years from now.